and it welcomes residents and guests alike every day. a fresh new look is achieved every three months or so. Ok, admittedly, for ME, this is a simple undertaking. well, I am so very glad you asked! I first heard the term 'L'arte d' arrangiarsi' when I read the book 'Eat Pray Love' a few years back. or literally, 'the art of arranging nothing into something'. sounds a lot like what i try to share here, huh?! the theme is simply autumn, and the subtext of that is nature. look closely for repetition - in color, shape, texture, imagery, subjects, and number. and of course, you'll see balance, scale, and composition. 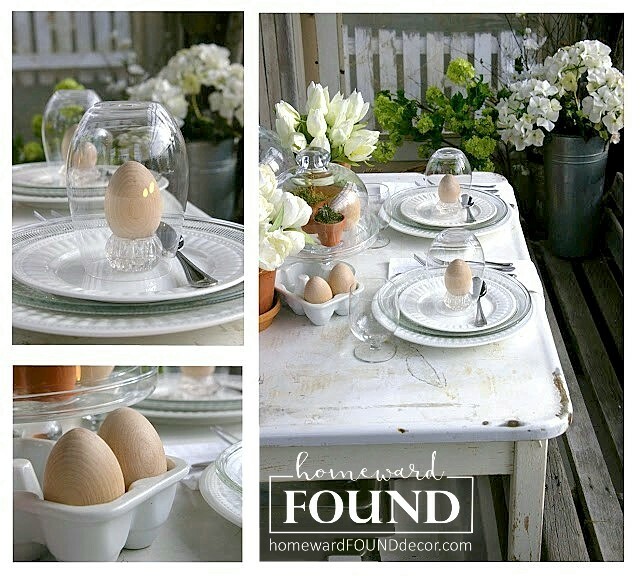 all of these work together to form a 'still life' vignette in home decor and store displays. * a small print is leaning against the back of the cabinet - this helps bring a brighter color to the dark background, and also reflects the theme of nature. the sunflowers on the table in the print speak of fall. * three small ceramic bowls in the 'Jewel Tea Autumn Leaf' pattern are lined up in front of the print - using items in odd numbers (quantities of 3 and 5 are most common) are pleasing to the eye. several small orange pumpkins and a grouping of leaves & nuts fill them for the effect of 'abundance' during the harvest season. also, the bowls are small and do not block the view of the print behind them. * you can just see the small print on the left in this photo. at the edge of it, a wood birdhouse has been placed, with a branch of leaves behind it - this hides the right edge of the painting so that it does not appear to 'float' on the shelf. the 'hidden edge' is integrated into the arrangement as it leads off to the right side. the birdhouse speaks again to the 'nature' theme of the display. * three small Sweet Sweater Pumpkins are placed in a tight group, along with a few more leaves. their rounded shapes echo the bowls, and the odd number of 3 objects is repeated. however, symmetry isn't the goal: if you lined the pumpkins up like the bowls are, this arrangement would be unbalanced to the eye. * we've created two arrangements on this small shelf, and linked them with the print and birdhouse. * first, note that this shelf is arranged with a centered placement - different than the shelf up above, which had two arrangements on either side linked by the print in the center. vary placement for interest! * two sets of four are used here, but due to their placement, they read as two sets of three to the eye - the three ceramic pumpkins on the left and the three stacked leatherbound Bibles are what you see first. * the ceramic pumpkin plate sits behind the other ceramic pumpkins - displaying objects on different levels and depths adds a sense of movement to your displays, and keeps them from looking like a police lineup. does anyone out there remember Christopher Lowell? he was always talking about 'lifts, levels, and elevations!' - he was right! stack things up, stand things up, lean them... use all of the 3-dimensional space you have, instead of just sitting things level with one another. * then your eye travels to the right, where you see the standing wood Bible box and the small pumpkin in front of it - their similar color makes them a secondary focal point on this shelf. * you see a repeat of the top shelf's Jewel Tea Autumn Leaf pattern ceramic bowl, just in a larger size, and the orange ceramic pumpkin from the middle shelf, and the trio of Sweet Sweater Pumpkins from the top shelf - this repetition of form and pattern ties all of the displays together. * a vine wreath stands at the back, adding color and brightness to the dark background and height to the composition. * fall leaves have been tucked into the wreath, the bowl, and under a pumpkin in front - these 'soften' the hard edges of the planter and bowl, and also offer a change from all of the 'round' shapes used here. * did you notice that the wreath, copper planter, and bowl make a trio? this is another repetition of three, along with the 3 sweater pumpkins used. also: the three sweater pumpkins and ceramic bowl are NOT placed directly below the ones used on the top shelf. these are placed on the opposite side of the composition - repetition and balance, but not symmetry. 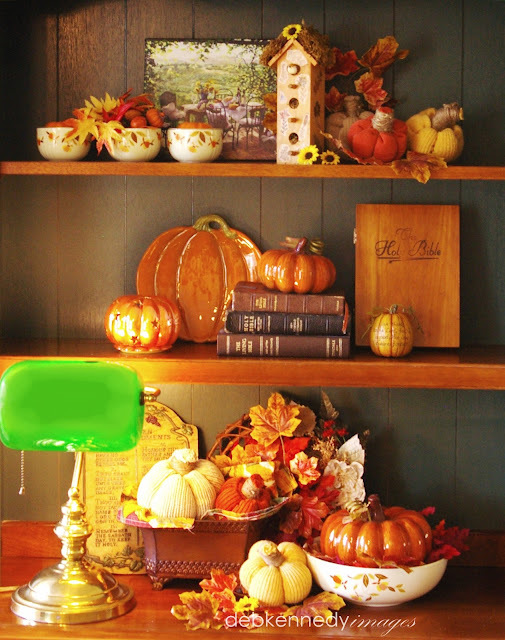 * the warm wood surface of the shelves and the green stained trim on this cabinet really worked well with the colors used in this season's display. like a frame on a painting, the furniture can set off a composition OR it can compete with it. try moving your furnishings around seasonally.... for instance, in summer and spring, a pale pine cabinet would work very well here to display lighter-toned accessories for those seasons. OK, now go empty your shelves and start rearranging!!! 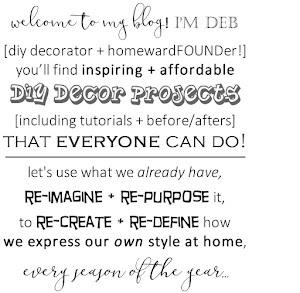 Hello Deb! I'm so thrilled you just visited my blog post about sweater pumpkins. I absolutely adored those pumpkins you made that I saw on Lulu's blog. I knew she got them from a store, but it's really special to hear from the original designer - wow! 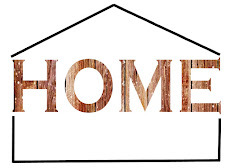 I love your blog here, HOMEward Found and will be following along. You've got such talent. I can't get over all these other pumpkins you make, too. I am going to update my post to send folks your way.